Room darkening curtains are flat with grommets at the heading spaced every 6". Select a curtain size at least 10% wider than your track size. Pattern VEIL ROOM DARKENING is 100% inherently flame resistant polyester and is washable. Check out the Cubicle Curtain Care page for care instructions. Using a blackout curtain will not provide complete blackout because light leaks between the track and the heading of the curtain. To achieve more of a room darkening effect, we can provide a flat masking valance the same width as the track channel. 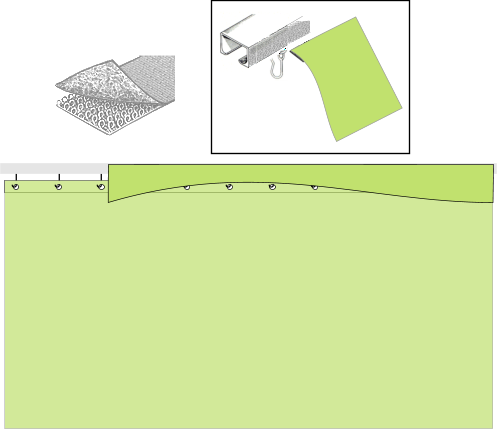 The valance will have Velcro loop tape along the top edge and we will supply the hook tape with adhesive backing to be applied to the face of the track channel. See the illustrations below. The height of the valance is 11".